Plastic toy racing car by Marquis Toys (Australia). Plastic toy racing car by Marquis Toys. This unusual plastic toy hails from Australia, and was produced by Marquis Toys. Date-wise it looks like a car of the 1930s, but it could easly have been produced well into the 1950s. The styling is reminiscent of the land speed record breaking cars of the 1930s, the streamlined shape of the body, the enclosed central cockpit for the driver, and the tail fin for stabiity at high speed, all adding to the impression. 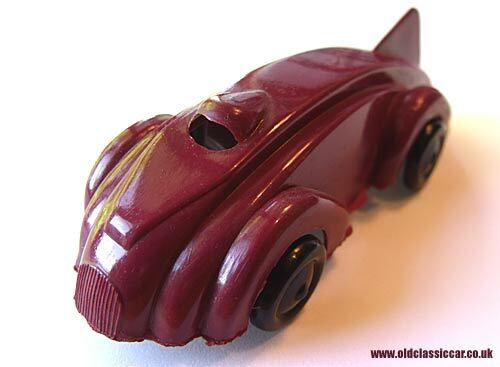 Unlike the similar-looking Renwal Speed King racer, the Marquis toy is made from reasonably thick plastic, the metal axles fit into holes left in the one-piece moulding. Plastic tyres are fitted, and there is no baseplate. 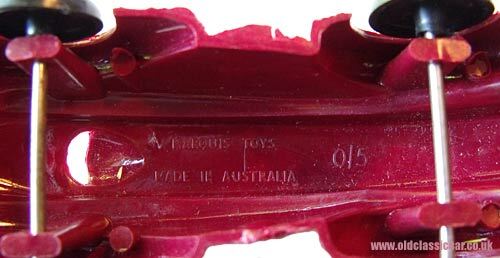 Printed into the underside of the body is the maker's name, Marquis Toys, "Made In Australia", and code "0/5". 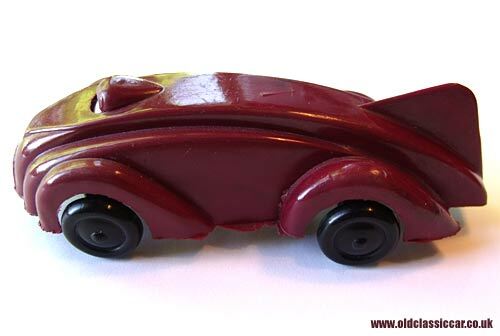 If anyone can shed any more light on this old toy car, please get in touch. It measures 4.25" in length.